Keep to the left at all major intersections in the valley. 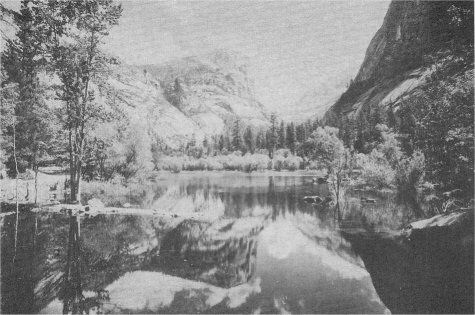 Map of Yosemite Valley pages 86 and 87. V-2 ARCH ROCK ENTRANCE STATION. There are 4 entrance stations in Yosemite where park rangers furnish information and collect visitor-use fees. This money is not used for operating the park but is deposited directly in the U. S. Treasury. 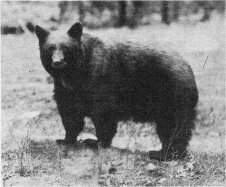 Additional detailed information is available at park headquarters and the Yosemite Museum. V-7 EL CAPITAN MORAINE AND JUNCTION OF OLD BIG OAK FLAT ROAD. The low ridge in the forest extending towards the river is a glacial deposit or “moraine” formed by the most recent ice-age glacier. As the ice melted back this moraine made a darn to help form Ancient Lake Yosemite which was between one and two thousand feet deep at the upper end of the valley and was 5 1/2 miles long. The lake gradually filled in with sediments to form the present level valley floor. The road on the other side of the highway is a section of the Old Big Oak Flat Road, now abandoned. V-8 EL CAPITAN. Read description under V-32, page 76. V-9 0LD STAGECOACH ROAD. You can turn back the pages of time by driving west over this section of the original stagecoach road which skirts the base of El Capitan. This is a one way loop drive from this point on the opposite side of the highway and continuing for about 3/4 of a mile back to the main highway. Except for an oiled surface this road is little changed from stagecoach days. V-10 SENTINEL ROCK, THE THREE BROTHERS, AND EL CAPITAN. 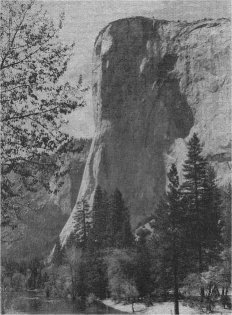 As you pass El Capitan you will see the Three Brothers on your left. The highest of the rocks, Eagle Peak, is 3,773 feet above the valley floor, it being the highest point on the north rim of the valley. 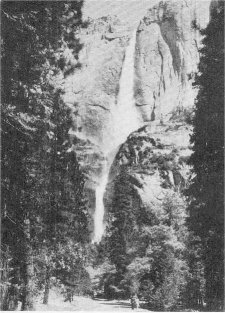 It may be reached on foot by way of the Yosemite Falls Trail. 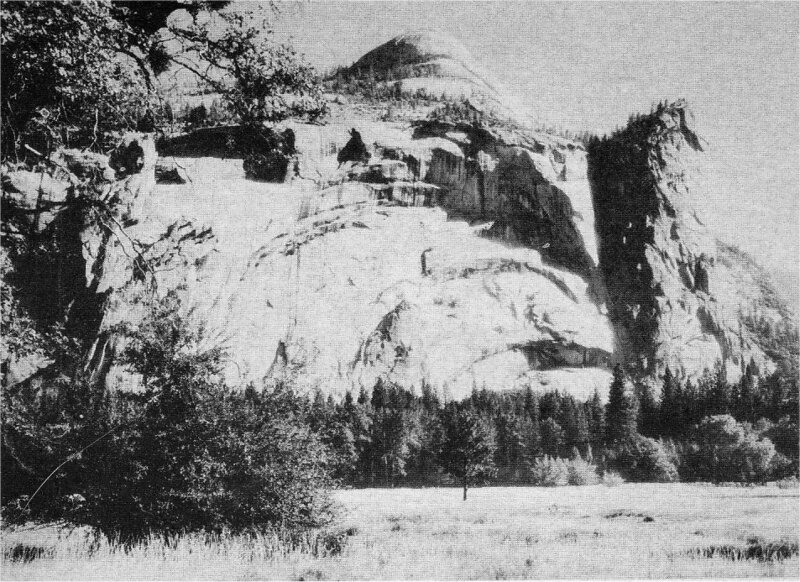 (Read description of Sentinel Rock under V-30, and of El Capitan under V-32, page 76. V-11 ROCKY POINT. On the down-valley side of the parking area is a rock slide which occurred about 1922. The scar is slowly being covered with vegetation. It tells the story of the geological and biological forces that continue to alter the landscape. Grooved and shiny glacier polish left by Ice Age glaciers can be seen about 25 feet above the base of the cliff close at hand. This is one of the few places where glacier polish can be seen on the floor of the valley. V-12 YOSEMITE LODGE. 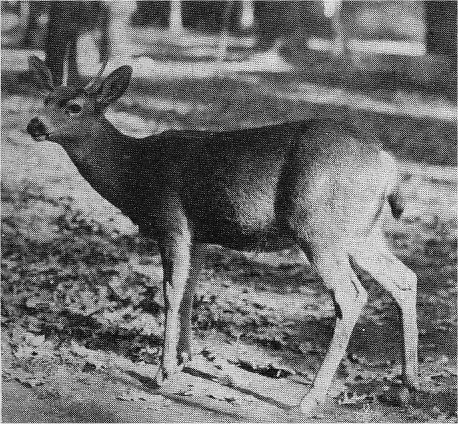 The Yosemite Lodge area was first developed by the U.S. Army as an Army post when it administered the park prior to 1916. In 1915 it was improved by the Desmond Company which had a 20-year franchise to provide hotel accommodations. During the period between 1920 and 1925 a succession of reorganizations brought the present Yosemite Park and Curry Co. into being. The history of this company is told under G-12, page 90. Today a new lodge replaces the old one which originally was an Army barracks. New modern cottages are taking the place of the old redwood cabins. A gift shop, grill, post office, swimming pool and cafeteria are located at the Lodge. This unit is open all year and is popular with the winter visitors. The row of dwellings across the road from the Lodge once were Army non-commissioned officers’ living quarters. at the base of the upper fall by slabs of ice formed from frozen spray falling off the cliff. The combined height of the falls is nearly twice that of the Empire State Building, at present the world’s tallest man-made structure, while the lower fall is twice the height of Niagara. 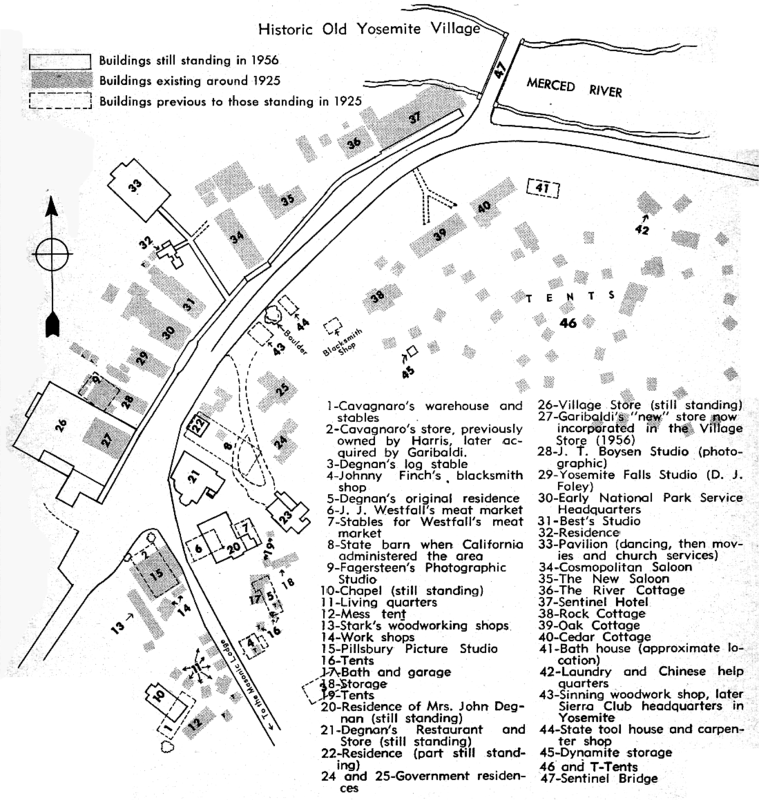 V-14 YOSEMITE VILLAGE. 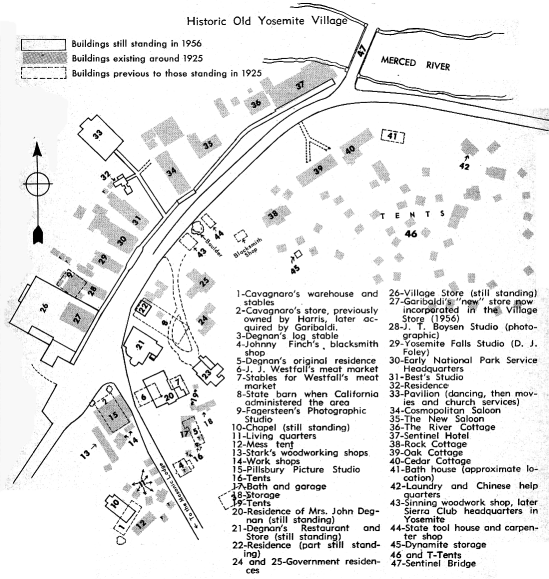 This includes the Park Service Headquarters, Yosemite Museum, post office, Western Union, photographic and curio shops, residences of permanent employees in the park, offices of the Yosemite Park and Curry Company, a garage and service station. Eventually the Village Store, studio and grill, Degnan’s restaurant and store, as well as Best’s Studio, will make up the merchandising portion of the village. V-16 LEWIS MEMORIAL HOSPITAL. The Lewis Memorial Hospital has a capacity of 16 beds and is equipped to handle most emergencies. It is operated under government contract and is staffed by competent doctors and nurses. The park dentist has an office in this building. The hospital was named in honor of W. B. Lewis, an early civilian superintendent of Yosemite National Park. The houses across the road from the hospital are residences of employees of the Yosemite Park and Curry Co. This area is called Tecoya, from the Indian word To-co-ya, “The Basket,” said to be associated with an Indian legend about North Dome. 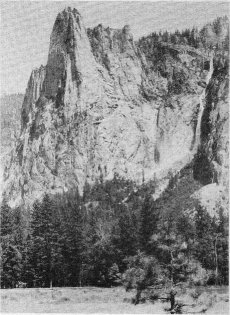 V-18 THE AHWAHNEE. The Ahwahnee was opened in 1927. It has 115 rooms and cottages decorated in an Indian motif. Rooms of special note are the dining room with its lofty massive construction and tall windows which frame the scenic views; the great lounge, a room of cathedral-like proportions, and the El Dorado Diggin’s, a cocktail lounge reminiscent of a street in an early California mining town. Ahwahnee is a native Indian word meaning “deep grassy valley”—the Yosemite Valley. V-20 SUGAR PINE. The largest of the few sugar pines on the valley floor is the tree growing to the left of the far end of the Sugar Pine Bridge. 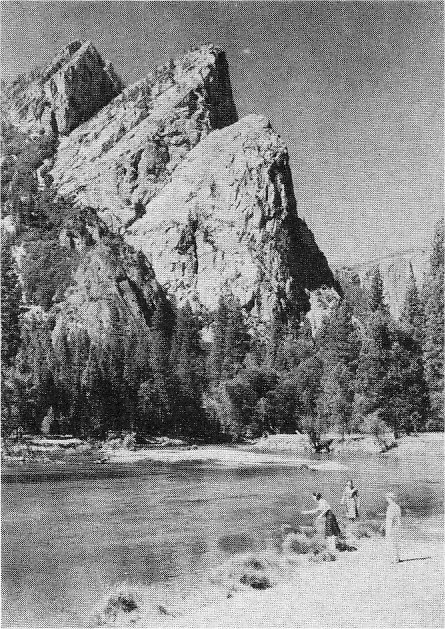 So highly regarded was this tree that in 1884 James M. Hutchings, then guardian of the Yosemite Grant, built the first stone work seen along the river to protect the bank from erosion and saves the tree. Sugar pines are normally found at a higher elevation. Their cones have been known to grow up to 26” in length. V-22 MIRROR LAKE. is at its best in spring and early summer when the absence of wind during early morning hours makes perfect reflections possible on its surface. This lake was formed by rock slides from the cliff walls which dammed Tenaya Creek some years ago. Filling in rapidly (as did ancient Lake Yosemite which formed the valley floor), Mirror Lake will probably disappear within a decade or so. Even now it all but dries up every autumn. Tenaya Creek, which feeds this lake, starts above Tenaya Lake near Tuolumne Meadows, and cascades from that lake into the upper part of the Tenaya box canyon. Annual Easter Sunrise services are held on the shore of Mirror Lake. CLOUD’S REST is the steep-sided mountain just beyond towering Half Dome. MT. WATKINS across the canyon from Cloud’s Rest is the peak which is reflected in Mirror Lake. The peak is 4,23 5 feet high and is named for Carleton E. Watkins, a pioneer Yosemite photographer. V-23 GLACIAL MORAINE. The low hill at this intersection is one of the few morainal ridges still existing on the valley floor. It was formed when two glaciers came together. This is known locally as “Ski Hill” because here began Yosemite’s skiing. V-24 HAPPY ISLES. The spur road leaves the highway junction and leads up to the Happy Isles and State Fish Hatchery. The Merced River at this point branches into several channels forming two main islands. Some 15 species of trees — practically every kind found on the valley floor—grow at Happy Isles. The great white blossoms of the Pacific flowering dogwood may be seen at their best here during early spring. This is also an important starting point for many High Sierra trails, including those to Vernal Fall, Nevada Fall, Little Yosemite, Half Dome, and the high Sierra camps. by the National Park Service for visitors who have their own camping equipment. V-25 CAMP 14. Continuing westward you see Camp 14 on your right. Beyond and across the Merced River are Camps 15 and 7. In the summer months interesting outdoor campfire programs are given by National Park Service ranger-naturalists nightly at Camps 7 and 14, (except Sunday when evening church services are conducted). Before approaching the Camp Curry intersection you will see an apple orchard on your left. It was planted in the 1860’s by James Lamon (pronounced le-man), one of the first homesteaders in the valley. This relic of pioneer days is now used as a parking area for Camp Curry. In winter part of the parking area is flooded and frozen over for a skating rink. V-26 CAMP CURRY. 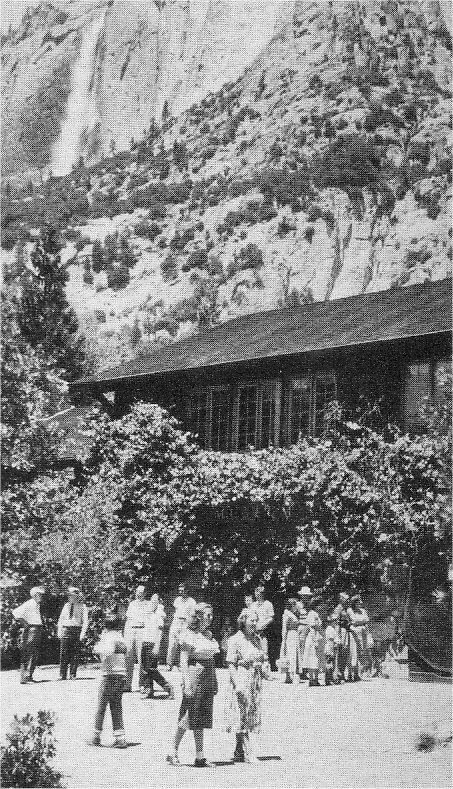 Camp Curry, one of the most popular valley accommodations, was founded by Mr. and Mrs. David Curry in 1899. A grocery store, gift shop, cafeteria, dining room, swimming pool, bicycle rental stand, dance pavilion, garage and service station, and sleeping accommodations are located here. Camp Curry is open from approximately May 15 to September 15. GLACIER POINT. Directly above Camp Curry is the Overhanging Rock at Glacier Point, 3,254 feet up from the valley floor. 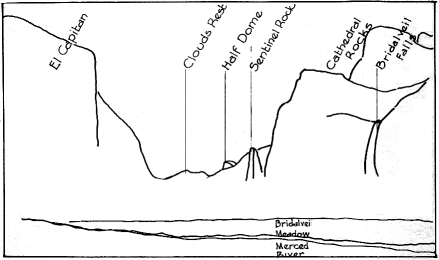 There are three trails to Glacier Point, 11/2 miles, 5 miles and 11 miles in length. By road it is 32 miles. In the spring Staircase Falls can be seen cascading from one ledge to another on the cliff above. Across the valley the great granite arcs are the exposed edges of rock shells known as the ROYAL ARCHES. Streaking down over the Royal Arches to the left are ROYAL ARCHES CASCADES, a striking 1000-foot springtime waterfall. Above the Royal Arches is NORTH DOME, 3,571 feet high. To the right of the arches WASHINGTON COLUMN rises like a tall skyscraper 1,912 feet above the valley. Less spectacular than some other rock forms, the Washington Column is still nearly four times as high as the Washington Monument. V-27 LE CONTE MEMORIAL LODGE Down-valley from Camp Curry, directly across the road from the Housekeeping Camp, is the LeConte Memorial Lodge built in 1903 by the Sierra Club, first at Camp Curry, but later moved to its present site. The memorial commemorates the work of Joseph LeConte, a famed geologist. Here the Sierra Club maintains a mountaineering and conservation library and exhibits and furnishes information about rock climbing. V-28 OLD VILLAGE. The Old Village started in the late 1850’s and was the center of activity prior to 1916. It boasted such enterprises as photographic studios, general store, post office, church, park headquarters, residences, hotels and saloons. At the present time (1956) the Old Village has a church, movie pavilion, store, grill and restaurant. It is planned to remove all man-made structures eventually and return the area to its natural state. Historical markers will then show former building sites. V-29 YOSEMITE CHAPEL Except for the Mountain House at Glacier Point, built one year earlier, the chapel is the oldest structure in use in Yosemite National Park. It was built in 1870 from funds collected from Sunday school children all over the country. Erected originally near the foot of the Four Mile Trail, the chapel was later moved to its present site. This chapel is unique in that it serves all faiths. V-30 VIEW OF YOSEMITE FALLS. Along the edge of the meadow down-valley from the Old Village you will have one of the finest distant views of Yosemite Falls. Detailed description under V-13, page 69. SENTINEL ROCK — From here Sentinel Rock can be seen to your left and slightly down-valley rising some 3,000 feet above the valley floor. It was named from its fancied likeness to a gigantic watchtower. Although Sentinel Rock has been climbed many times by various routes, it was not until 1949 that the face was scaled in a feat of skill and endurance which took 5 days. trees planted at the site of the old well. SENTINEL FALLS is on the right as you face Sentinel Rock. Prominent only in the early spring and summer, they start in the highest hanging valley in the vicinity. The water cascades down the face of the cliff some 2,000 feet in a series of spectacular leaps and drops. V-32 VIEW OF EL CAPITAN. 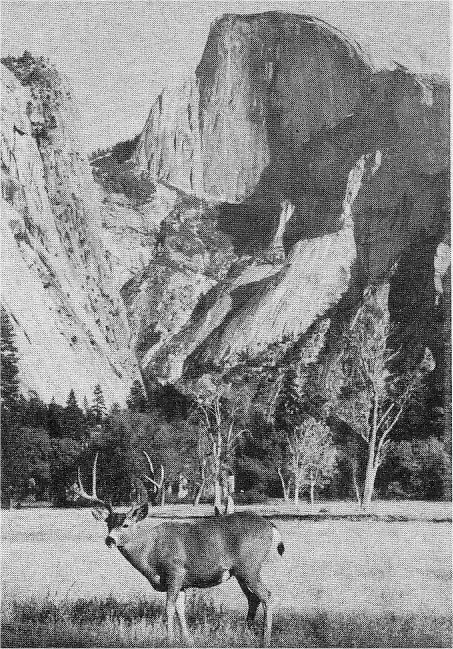 El Capitan is one of the largest exposed monoliths of granite in the world. 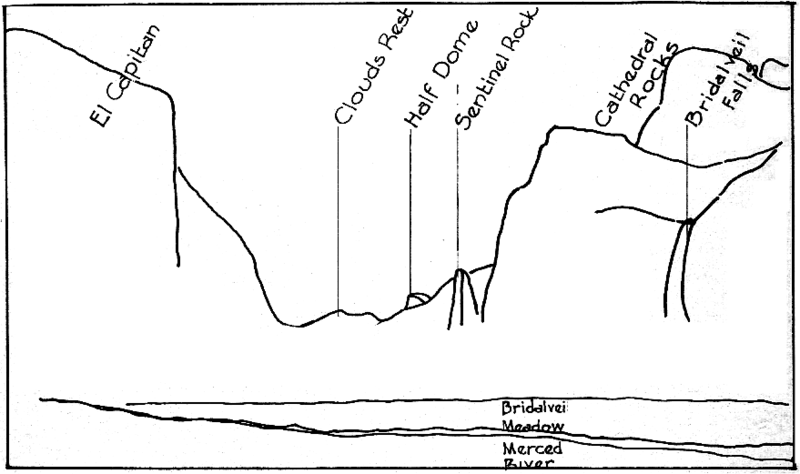 The sheer cliff is about 3,000 feet high and the summit of the rock is 3,564 feet above the valley floor. Look for the dark mass on the face of the cliff which suggests the map of North America. An 80-foot pine tree many hundred years old is rooted in cracks on the face of El Capitan and can be located by following the “map” downward through Central America to an overhanging ledge. El Capitan was named for its imposing position and dominating size among the valley cliffs. V-33 VIEW OF THE THREE BROTHERS. Read full description under V-10, page 69. V-34 CATHEDRAL SPIRES. Named for an obvious likeness, these two giant shafts of granite are far larger than any real cathedral spires. The right hand spire is some 2,100 feet, the other about 1,900 feet above the valley floor. Both spires have been climbed by expert rock climbers but the ascent is very difficult. Cathedral Spires were named by James M. Hutchings in September 1862. V-35 MERCED RIVER. There are fine views of the Merced River as you drive between Cathedral Spires and Bridalveil Fall. Starting among the snowfields in the High Sierra, the Merced River drops 11,000 feet in its run to the sea. The name Merced has been shortened from its original — El Rio de Nuestra Senora de la Merced — River of Our Lady of Mercy. It was named by Gabriel Moraga in September 1806 during his expedition in the San Joaquin Valley because of its refreshing water after seeing only muddy streams during his journey. BRIDALVEIL MORAINE — As you approach the widened part of the highway in front of Bridalveil Fall, the road cut through a bank on your left reveals a section of Bridalveil Moraine, a pile of coarse and fine-ground rock left by Yosemite Valley glaciers. wind which creates the spray that caused the white man to name the fall Bridalveil. For closer views of the fall, enter the parking area ahead and follow the footpath to the base. LEANING TOWER — To the right of Bridalveil Fall is a towering pinnacle of granite rising about 1800 feet above the valley which, from this angle, appears to be leaning outward from the cliff below. 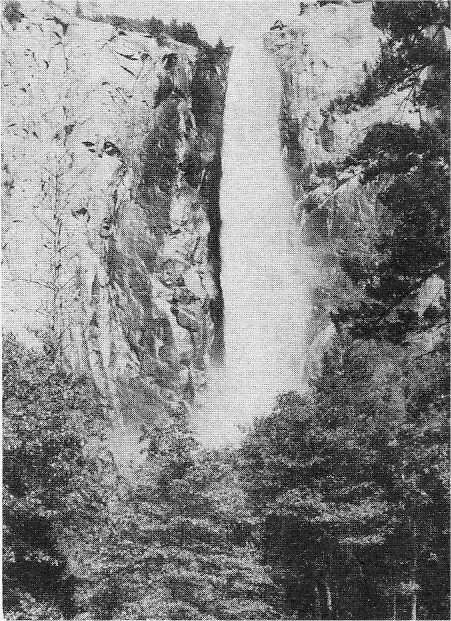 RIBBON FALL — Across the valley and to the left of El Capitan is Ribbon Fall, 1612 feet high. It flows only in spring and is the highest single drop in Yosemite though not leaping free of the cliff surface. V-38 TUNNEL VIEW. From the parking area at the east end of the Wawona Tunnel is the most picturesque and most photographed general view of Yosemite Valley. This point is confused frequently with the historical Inspiration Point which is on the old Wawona Road some 900 feet above you. Evidences of the geological forces which formed the valley — stream erosion and glacial ice — can be seen from this point: the sheer glacial-plucked cliffs, the stream-cut valley of Bridalveil Creek left hanging by glacial action, and the flat floor of the valley. 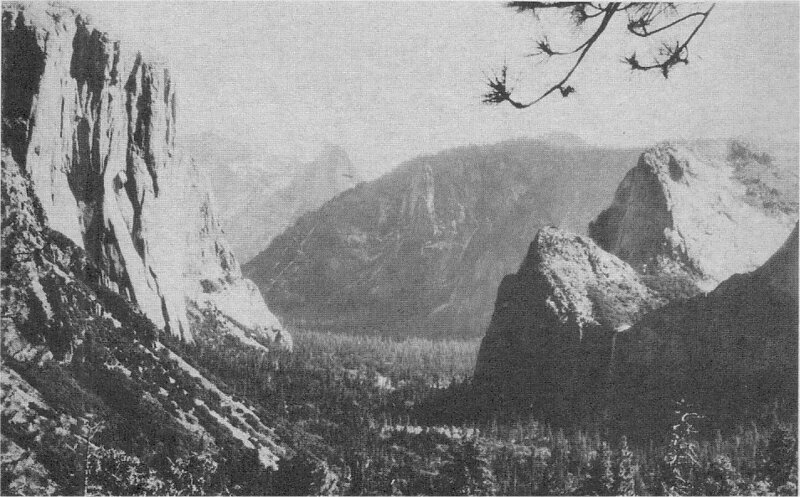 William Abrams in 1849 was probably the first white man to see Yosemite Valley. 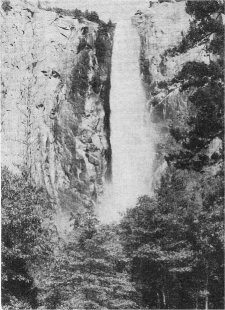 In 1851 the Mariposa Battalion, while chasing the Yosemite Indians along the cliffs above you, entered the valley and became the first “effective” discoverers. The barely discernible line part way up and crossing the broken rock slope on the other side of the valley is a part of the Old Big Oak Flat Road described under C-1, page 92. V-39 CROSSING THE VALLEY ON THE POHONO ROAD. As you start across the valley from the intersection near Bridalveil Fall parking area you will pass through a small grove of trees. On the right side of the road in this little grove is a marker on the site where two prospectors were reported killed by Indians on May 2, 1852. Indians found later wearing the prospectors’ clothing were executed by soldiers. V-40 PRESIDENT THEODORE ROOSEVELT AND JOHN MUIR CAMPSITE. “On this site President Theodore Roosevelt sat beside a campfire with John Muir on May 17, 1903 and talked ‘forest good.’ Muir urged the President to work for preservation of the priceless remnants of America’s wilderness. At this spot one of our country’s foremost conservationists received great inspiration.” In this meadow the Mariposa Battalion also had camped at the time of their entrance into Yosemite Valley on March 27, 1811. It was then that Dr. Lafayette H. Bunnell, surgeon of the battalion, proposed the name Yosemite, a corruption of “O-ham'i-te” or “Oo-soo’-ma-te,” (Indian for ‘grizzly bear.’), a term he picked up from the Indian guide Bunnell did not know that this name applied to only those Indians in the valley who lived north of the river and that all the Indians referred to themselves as Ahwahneeches, people of Ahwahnee, the deep grassy valley.